They say breakfast is the most important meal of the day, but many people skip out or skimp out on the opportunity to get fuel for their bodies in the morning. For some, breakfast is a bowl of cold cereal or a granola bar and a cup of coffee; for others, it’s just the coffee. If you’re inclined to get a good breakfast every morning, but you don’t necessarily have the time or inclination to cook yourself bacon and eggs, you can find lots of choices on the McDonald’s Breakfast Menu. This guide lists them all, by number of calories, from 150 calories for light eaters to a whopping 1,350 for those who want the heartiest of breakfasts. Read on to get the info you need to decide what menu items might make it on your breakfast plan. McDonald’s breakfast hours used to end at 10:30 a.m. before the chain launched its all-day breakfast menu on Oct. 6, 2015. The change was accompanied by intense fanfare, but it was really only revolutionary because it was McDonald’s. Sonic and Jack in the Box have had all-day breakfast for years, and of course, places like Denny’s and Perkins are well-known for their anytime breakfasts. But you can’t get an Egg McMuffin or a McGriddles at any of those places, and that’s where McDonald’s cleaned up. The all-day breakfast menu is pretty close to the full breakfast menu, but it’s taken a year and a half and several trial runs to get it built up to that point. The fast-food giant, which began testing all-day breakfast in April 2015, started the venture with a limited menu. Because of limited space in kitchens after the standard McDonald’s breakfast hours, restaurants offered either McMuffins or biscuits, but not both, and the beloved McGriddles were nowhere to be found. That was bad news for dining partners whose breakfast choices were on both sides of that fence. McDonald’s did further testing in 2016 and in September expanded its breakfast menu to the almost-complete version we know today. While all-day breakfast appears to be well-established at McDonald’s, the boosts in sales the chain enjoyed at the launch of the all-day breakfast menu have started to slip. In January, McDonald’s said its U.S. comparable restaurant sales had gone down for the first time in a year and a half. That said, analysts had not only predicted this, they had predicted the dip would be larger. Sales fell 1.3 percent in the fourth quarter of 2016, but analysts had predicted the drop would be 1.4 percent, according to Consensus Metrix, a research firm. Get to the McDonald’s Breakfast Menu, Already! But enough gloom and doom. You’re here for info on the food, right? There’s something for everyone on the McDonald’s breakfast menu, whether you’re watching calories or carbs, or looking to start the day with protein or fiber or both. So check out the McDonald’s breakfast calories, from low to high. For a quick low-calorie breakfast, try the creamy Fruit ‘N Yogurt Parfait. Low-fat vanilla yogurt is layered with blueberries and strawberries and topped with granola. You’ll get 4g protein for just 150 calories and 30g carbs, and your day will start on a sweet, refreshing note with the goodness of protein, fruit and grains. And with a low calorie count, you can add a side. If you work in an office, the Fruit ‘N Yogurt Parfait makes for a leisurely breakfast at your desk while you wait for your computer to boot up. Another 150-calorie breakfast item, McDonald’s Hash Browns are usually ordered as a side. Low in calories with 16g carbs, these crunchy delights only deliver 1g protein, so they are basically neither healthy nor unhealthy, but they’re still good. So maybe pair them with the Fruit ‘N Yogurt Parfait for a nice 300-calorie breakfast. Remember to calculate any butter you request for your hash browns or any other breakfast item; McDonald’s whipped butter has 40 calories per pat. Menu items do have the butter calculated in the calories when the butter is already on the items when they are served. For just 260 calories, the Egg White Delight McMuffin delivers a combination of 16g protein and 29g carbs for a good start to your day. Grilled egg whites, extra-lean Canadian bacon and white cheddar cheese are tucked inside a warm toasted English muffin. If you’re counting cholesterol, this has only 35mg because of the lack of egg yolk, and both the white cheddar and lack of egg yolk keep this light sandwich low in calories while still delivering a decent amount of protein. Wake up with a little spice with the 290-calorie Sausage Burrito. A soft tortilla holds a scrambled egg, sausage, melted American cheese, tomatoes, green chiles and onions. This morning burrito has 13g protein and 26g carbs, and it provides a nice mix of ingredients in a holder that’s easy to hang onto. If you’re going through the drive-thru, that could be a handy aspect, as you won’t have cheese dripping in your lap as long as you keep the closed end of the burrito facing downward. The McDonald’s Egg McMuffin is a longtime breakfast classic, featuring a toasted and buttered English muffin containing an egg, lean Canadian bacon and melted American cheese. You’ll get 18g protein for just 300 calories, and 30g carbs. That egg yolk and ham will give you 245mg cholesterol (81 percent of your daily value), which seems a lot for the first meal of the day, but we keep hearing that eggs and even cholesterol may have gotten a bum rap, so your mileage may vary in this area. Grab a bowl of hearty Fruit & Maple Oatmeal for a warm, comforting breakfast. This oatmeal, which comes with brown sugar, is enhanced by diced apples and a cranberry raisin blend and topped by light cream. You’ll get 6g protein and 5g fiber for 310 calories. All that fruit and brown sugar hikes the carbs up to 62g, but you can have your oatmeal without brown sugar and cut your carbs down to 49g. Giving up brown sugar on oatmeal would be tough for me, but I could probably at least skimp on it with all the fruit and cream in this. Swap the egg in the Egg McMuffin for a hot sausage patty and you have the Sausage McMuffin. With a warm toasted English muffin and melted American cheese, this savory sandwich provides 14g protein for 400 calories and 29g carbs. My love of sausage has always made this my favorite McMuffin. I’ve always said that if I became a vegetarian, what I’d miss most are cured meats, particularly sausage patties and strips of delicious bacon. And I don’t know which of those two I’d miss most. If you love bacon and eggs and you also love griddle cakes, you don’t have to choose. 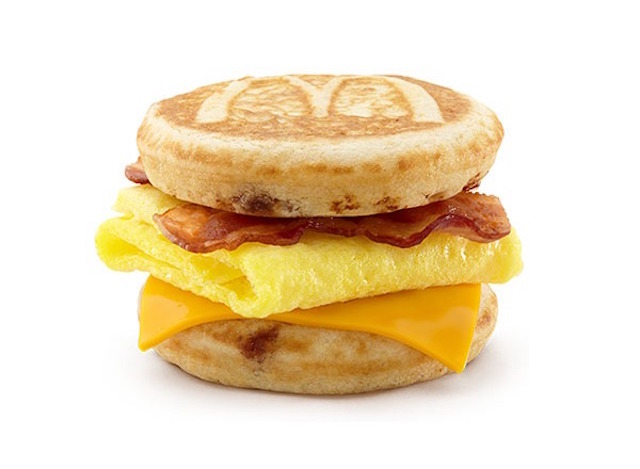 The popular Bacon, Egg & Cheese McGriddles piles thick-cut Applewood smoked bacon, an egg and melty American cheese between a pair of soft, warm, lightly browned griddle cakes sweetened with maple. You’ll get 18g protein from this 420-calorie handful of breakfast goodness. There’s a whole lot going on in the Sausage McGriddles, which is a favorite in the McDonald’s lineup. Soft, warm griddle cakes, infused with sweet maple, embrace a hot and savory sausage patty. The combination of sweet maple and the savory complexity of sausage makes for a sweet-and-savory party in your mouth and a tasty way to get moving in the morning. Calories are at 430 with 11g protein and 42g carbs. A warm buttered buttermilk biscuit is the start of the Bacon, Egg & Cheese Biscuit, which is piled with thick Applewood smoked bacon, a fluffy egg and a slice of melted American cheese, a tantalizing combination for sure. It’s 450 calories with 18g protein and 40g carbs with 3g fiber. Simple deliciousness pairs a toasty-warm buttered buttermilk biscuit with a hot sausage patty in McDonald’s Sausage Biscuit. This hearty sandwich has 460 calories and 36g carbs and delivers 11g protein. But what strikes me is that sausage on a biscuit has only 10 calories more than bacon, egg and cheese on a biscuit. The Sausage McMuffin With Egg delivers a toasty-hot sausage patty, an egg and melted American cheese on an English muffin that’s freshly toasted. At 470 calories, you’ll get a nice 21g protein and 30g carbs for a well-rounded morning meal. Adding an egg to the Sausage Biscuit brings your protein total to 17g. The Sausage Biscuit With Egg, which piles a savory sausage patty and a fluffy egg atop a buttery buttermilk biscuit, has 530 calories and 38g carbs. You’ll be full after this breakfast sandwich. If you’re looking for a hearty one-handed meal, as McDonald’s says, “wake with steak.” The Steak, Egg & Cheese Biscuit piles a seasoned steak patty, a fluffy egg, grilled onions and a slice of melted American cheese on a warm biscuit brushed with butter. Packed with 25g protein and 40g carbs, this super-duper sandwich has 530 calories, 230mg cholesterol and 1,490mg sodium. Another hearty sandwich, the Sausage, Egg & Cheese McGriddles piles warm and soft maple-infused griddle cakes with a juicy sausage patty, fluffy egg and melted American cheese. You’ll get 20g protein and 45g carbs for 550 calories, with 215mg cholesterol and 1,280mg sodium, and a full breakfast in a sandwich. If you’re more into bagels than biscuits and English muffins, the Bacon, Egg & Cheese Bagel may be for you. A toasted and buttered bagel is a nice, dense holder for thick Applewood smoked bacon, a fluffy egg, and not one but two slices of melted American cheese. This sandwich has 550 calories, a whopping 26g protein, 54g carbs, 225mg cholesterol and 1,260mg sodium. Fluffy hotcakes seem pretty innocuous, but three McDonald’s Hotcakes come to 600 calories with a side of butter and syrup, and the 102g carbs are a third of your recommended limit for the day. But if you’re me, and you don’t like syrup, you can skip it to bring the total down to 410 calories and 56g carbs. You’ll get 9g protein either way. Maybe you’d like a big traditional breakfast but the last thing you feel like doing in the morning is frying eggs and baking biscuits. The Big Breakfast will take care of that for you, with fluffy scrambled eggs, tangy hot sausage, sumptuously crisp hash browns and a buttery buttermilk biscuit. Protein is up to 25g, with 53g carbs, but take note of the 465mg cholesterol, which is 155 percent of the total daily value. If you like the McDonald’s Hotcakes but you want more protein, you can go for Hotcakes & Sausage for a nice 16g. Calories go up to 790, and carbs are at 103g (57g if you skip the syrup on the Hotcakes). What’s interesting here is that if you leave off the syrup, the calories go down to 600, exactly the calories of the Hotcakes. That would basically make your sausage patty free! If breakfast is the most important meal of the day, this one, combining scrambled eggs, sausage, hash browns, hotcakes and a biscuit, could just about feed you for the whole day. The Big Breakfast With Hotcakes delivers 35g protein, which is pretty impressive. But the tradeoff is 155g carbs (half of the daily value), 510mg cholesterol (169 percent DV), 65g fat (100 percent DV), and 2,100mg sodium (87 percent DV). On the plus side, you’ll get 6g fiber and 40 percent of the iron you need for the day. But hey, not to sound like a broken record, but you can drop some of those numbers by leaving off the hotcake syrup, which will drop calories to 1,170 and carbs to 109g. With many of these breakfast items, you’re getting adequate protein and dairy with the meat and cheese but could use some fruit. While the Fruit ‘N Yogurt Parfait is a decent option to make heartier meals out of lighter fare, some of the heavier meals could do well with an even lighter touch for complete McDonald’s breakfast nutrition. Cuties mandarin oranges add only 35 calories and 8g carbs each, and an order of apple slices is even lower at just 15 calories and only 4g carbs. You’ll get 160 percent of daily value of Vitamin C with the apples and 35 percent with the oranges, and either would make a good snack anytime during the day. Take note: Just like the regular menu, you can also get a Value Meal to curb McDonald’s Breakfast Menu prices. For breakfast, that adds an order of Hash Browns and a small McCafe Coffee. If you’ve never had McDonald’s coffee, it’s really as good as the commercials imply. I even have a bag of the ground coffee in my freezer. I have good news and bad news for the all-day breakfast menu. The good news is the launch of the Chicken McGriddles that happened in January. The bad news is that unless you live in Florida, you’re not getting one. And even if you do live in Florida, the 390-calorie Chicken McGriddles is scheduled to leave the menu on April 26. It’s basically a McGriddles with a McChicken patty, so you could always engineer your own, but if it proves popular enough, the Chicken McGriddles might make its way to the national McDonald’s breakfast menu. Note that these breakfast items are the few that are not on the All-Day Breakfast Menu: Big Breakfast, Big Breakfast With Hotcakes, Egg White Delight McMuffin, Steak Egg & Cheese Breakfast and Bacon Egg and Cheese Bagel. You’ll have to order these off the McDonald’s Breakfast Menu during regular McDonald’s breakfast hours.